Q. 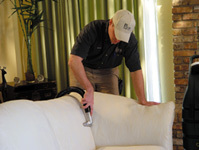 How is upholstery cleaning different from carpet cleaning? A. There are major differences in how carpets and furnishings are cleaned. For upholstery fabric, it is important not to use an excess of water, as this can cause bacteria or mold to grow, bring out unpleasant odors and cause the fabric to becomes soiled more quickly in the future. Depending upon the particular type of fabric, too much water in the cleaning process may even damage it. Upholstery in general requires gentler handling and specific cleaning methods according to the fabric. Q. Why is it important to professionally clean furniture? A. Over time, dirt, dust, pet dander and other potentially harmful toxins can get trapped in upholstery fabric, which might lead to allergies and respiratory ailments. Children, the elderly and pets might be especially susceptible to these types of substances. Professional fabric cleaning is far more thorough than what you can do on your own. Not only will your furniture look and smell great — it will also be much healthier and far more enjoyable to use. Q. Can KIWI get rid of stains and pet odors from furniture upholstery? A. Absolutely! As we do with our carpet cleaning, we’ll thoroughly clean your upholstery so it’s clean and fresh. KIWI has nearly 30 years of experience, so our expert technicians know how to care for specialty materials such as leather cleaning, chenille, boucle and silk brocades. For homes with children or pets, regular professional upholstery cleaning is recommended. There may be a lot of pet fur and dander in the fabrics which can cause allergic reactions, and children (and pets) may unknowingly transfer molds and other toxins from the outdoors which could also pose health risks. Q. What kind of chemicals do you use in your upholstery cleaning? A. Unlike other furniture cleaning companies, KIWI uses eco-friendly and people-friendly green cleaning solutions that are biodegradable and safe for human and animal members of your family. Q. What type of experience and expertise does KIWI have? Are you certified and insured? A. Yes, KIWI is certified by the Institute of Inspection, Cleaning and Restoration Certification (IICRC) and our professional technicians have received extensive training in the identification, handling and treatment of a wide variety of fabrics and different types of construction. If you try to remove stains on your own, it may result in discoloration or possibly even tearing of delicate fabric. KIWI knows how to take great care of your furniture to bring it back to like-new condition. Q. Does KIWI offer Leather Cleaning? Yes! KIWI has offered leather cleaning for over 30 years and we have perfected the art. Our technicians will be able to identify your leather and then use our one of a kind leather cleaning methods to get your leather furniture looking great again. Whether you have suede, faux suede, finished, unfinished, soft or nubuck, KIWI is able to get your leather cleaned, and usually right in your own home! Q. What does KIWI offer that other cleaning companies don’t? A. At KIWI, you’ll find a wide spectrum of services in addition to cleaning, such as restoration and repair. We also provide on-site upholstery cleaning, so you don’t have to move heavy equipment to have it cleaned and then wait for an appointment to pick it up again. We’ll clean your furniture so it looks beautiful again, and all within your schedule.